Did anyone get involved with the Depressed Cake Shop? Selling grey cakes to raise awareness of mental health issues, this brain piñata cake really caught my attention. Break open its cakey exterior, and sweets come tumbling out. Now THIS is a cake I can get behind. 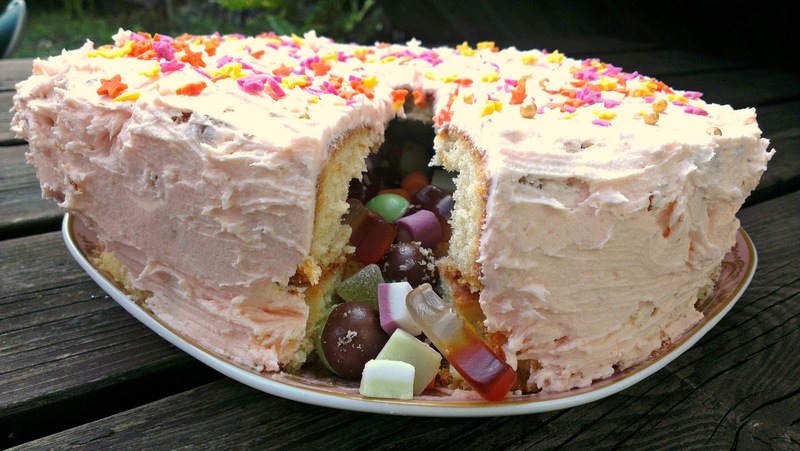 Inspired by that, I've scaled it up, iced it in the manner of a child (by decorating it with All The Things), and stuffed it with my favourite sweets. You can hang it from the ceiling and smash it open with sticks in the manner of a traditional pinata, or simply cut it open. I would strongly recommend the latter. It's easier to assemble than you think and immensely fun to make. Suitable for kids' parties / afternoon tea / rainy Tuesdays / pretty much anything, actually. It's not easy to transport though, so make it wherever you're planning to eat it. Heat the oven to 180C/350F/gas mark 4. Line two 20cm cake tins with greaseproof paper. They can be the same depth or one can be shallower than the other. If they're different depths, the thinner one will form the base of the cake. Cream together the butter and sugar until light and fluffy, then gradually add the eggs, mixing well after each addition. Mix in the vanilla extract and fold in the flour. Add the milk until the mixture's at a dropping consistency - you may not need it all. If your cakes are the same depth, bake them for 40-45 minutes. If one is smaller, bake that one for 25-30 minutes. They're ready when a skewer comes out clean. Leave to cool. Make the butter icing by creaming together the butter, icing sugar and milk until it's a smooth consistency. Now stuff starts to get fun. Flip the big cake over so the smooth side is on the bottom. Score a circle on it with a knife, at least 3cm from the edge. Gently scoop out the cake, making sure you don't go through the bottom. Fill it with sweets and ice the lip of the cake. There is now leftover cake. You know what to do with this. If you've got two big cakes, hollow out the second one and stick it to the top. If you've got a small cake, leave it as it is and stick it to the first one, then flip the whole lot over. Cover the cake with icing and decorations. Cut the first slice and watch the sweets fall out. Now slice the rest quickly before it starts to cave in. Hooray! Piñata cake! Well done, everyone's impressed and no-one needs to know how easy it was. My sister tried this one time but she took her cooked cake out of the oven, cut the middle out, chucked in a whole packet of Haribo star mix, and then shoved the middle of the cake back on top of the Haribo, squashed it down, then iced it up. The result of this was, the Haribo melted from the heat of the hot cake into a solid gummy mass. When we tried to cut the cake, this solid lump in the middle was hard to cut and even harder to eat. Oh no! Leaving to cool is definitely a key part of this method. Next time distract yourself with the leftover cake. I bloody love your sister. I hadn't heard of The Depressed Cake Shop; what a brilliant way to get people talking about mental health. I'm gutted to have missed it - may have to look into organising something in Bristol. Isn't it great? Hopefully there'll be more events in future. If you're on Facebook, there's a very active group there.